« October on the farm. Sheep! A Local Story for Remembrance Day 2018. This pristine Commonwealth War Graves headstone commemorating Lilian Taylor has kept its lonely vigil in Sulgrave churchyard for almost 100 years. To mark the centenary of the signing of the armistice which brought the Great War to an end, this year the Royal British Legion has created a special brooch dedicated to the memory of the courageous women who served and lost their lives as a direct result of the First World War. 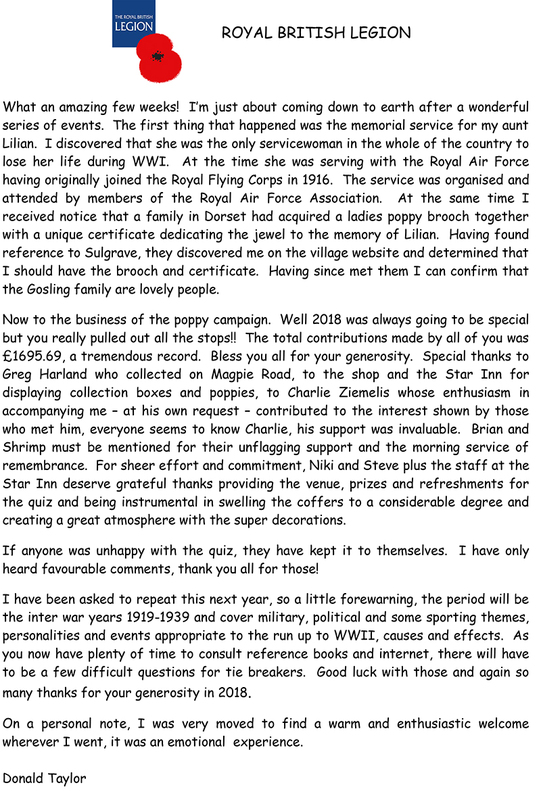 Read also Donald Taylor’s report on this year’s Poppy Collection. This rather haunting photograph from 1917 shows Lilian Taylor of Sulgrave in her uniform as a member of the Royal Flying Corps. She later became one of the earliest members of the Women’s Royal Air Force. As recorded on the headstone she died on 6th November 1918. She was one of the many who survived the war, only to die in the dreadful flu epidemic which coincided with its end. Sadly, very little is known about her war service but the presence of the Commonwealth War Graves headstone in the churchyard suggests that she may have been serving in France where she perhaps became infected and was then invalided home to Sulgrave where she died. She was aunt to Donald Taylor who is, of course, a familiar sight in the village, especially at this time when he does sterling work selling poppies on behalf of the Royal British Legion. I am looking to contact Donald Taylor whom I understand may live in Sulgrave. I understand that he does a lot for the Poppy Appeal and I have something that I would like to give him as it should belong to him… It is a limited edition poppy that I have received today. The poppy collection commemorates each of the brave women who died in the First World War and I have, by chance, purchased the poppy commemorating his auntie, Lilian Taylor. My wife would rather he have the poppy as her family and I would very much appreciate it if you could arrange for my contact details to be passed to him in order that I can send the gift to him. The brooch and its box. Donald Taylor and Pamela Spreckley lay the RAF wreath. My paternal grandmother was Catherine Taylor, formerly of Wootton House, Little Street, and so Lilian was my “great aunt”! It was therefore a pleasure and a privilege to act as a “go between” for Donald and the kind donor of the brooch. Very shortly, Donald will be wearing it whilst doing the rounds with tray and collecting tin so don’t forget to buy your poppy. The annual Remembrance Service will be held in the church on Sunday 11th November at 6.00 pm. Those who have not seen it may like to click here to read the stories of two “local heroes” and also those of all 18 of the men and women of the village who lost their lives in two world wars. As part of the commemoration of the 100th anniversary of the end of the Great Warm, a WWI themed quiz will take place at the Star on Tuesday, 6th November 2018 in aid of the Royal British Legion. Teams may enter free of charge but an RBL collection box will be present for donations. Members of the winning team will each receive a voucher for a free meal at the Star. There will be some related artefacts on display and a few anecdotes. Come and enjoy, you are sure to know some of the answers and guess some, but not many will know all of them! There’s a challenge. It will be fun! This entry was posted on Thursday, October 25th, 2018 at 8:48 pm	and is filed under News. You can follow any responses to this entry through the RSS 2.0 feed. You can skip to the end and leave a response. Pinging is currently not allowed. Remembering my great great uncle Wallace James Smith .born in sulgrave. Also in the church memorial.